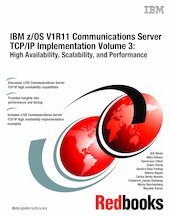 In this IBM Redbooks® publication, we begin with a discussion of Virtual IP Addressing (VIPA), a TCP/IP high-availability approach that was introduced by the z/OS Communications Server. We then show how to use VIPA for high availability, both with and without a dynamic routing protocol. We also discuss a number of different workload balancing approaches that you can use with the z/OS Communications Server. We also explain the optimized Sysplex Distributor intra-sysplex load balancing. This function represents improved multitier application support using optimized local connections together with weight values from extended Workload Manager (WLM) interfaces. Finally, we highlight the most important tuning parameters and suggest parameter values that we observed to maximize performance in many client installations. This book does not duplicate the information in those publications. Instead, it complements them with practical implementation scenarios that can be useful in your environment. To determine at what level a specific function was introduced, refer to z/OS Communications Server: New Function Summary, GC31-8771. For complete details, we encourage you to review the documents referred to in "Related publications" on page 303.